Organise a profitable Run / Walk / Ride at an easily manageable scale with 20-200 participants. Use this innovative “Get-Togethers” concept to organise multiple events throughout the year, bringing together your local community in activity. Including numerous guides, templates & tools, as well as your branding licence, this pack has everything you need to organise community Get-Togethers. Organise a profitable Run / Walk / Ride at an easily manageable scale with 20-200 participants. We call this community offering a ‘get-together’ to emphasise the simplicity of putting one on. Not everyone has the time or resources to organise and manage a large-scale event and if that’s the case, this pack is for you. 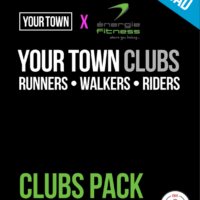 Intended to be used for running, walking and cycling events including less than 200 participants, this pack gives you all the tools & templates for establishing a simple series of events that could be run multiple times a year with minimal effort. Exclusive access to our Event Materials Packs for bespoke medals, banners and merchandise. The initial investment covers the pack, your core reusable event materials and a one year branding license. From then on, you will simply pay a much smaller annual fee for the branding license!